Experience the same system used by these elite teams – Texas A&M, Chicago Cubs, Arizona Diamondbacks, Seattle Mariners, Houston Rockets, Philadelphia Phillies, San Diego Padres, Canada Baseball, Portland Trailblazers, New York Mets, professional tennis and golf and now the Houston ASTROS! So very excited to offer this unique opportunity for a limited group of individuals who want to dedicate a few hours per week to increased strength and usable mobility; basically, radically improve your fitness level. As a former ballerina turned exercise instructor/trainer and golf fitness specialist I have learned the best techniques from the top in the fitness, medical and elite sports industry. I’ve spent many years testing and teaching strength and mobility but for the last 4 years worked very hard to learn and teach the new FRC/KINSTRETCH approach that is so successful as evidenced by it’s growth in the professional and collegiate elite sports arena and is spreading all over the world. 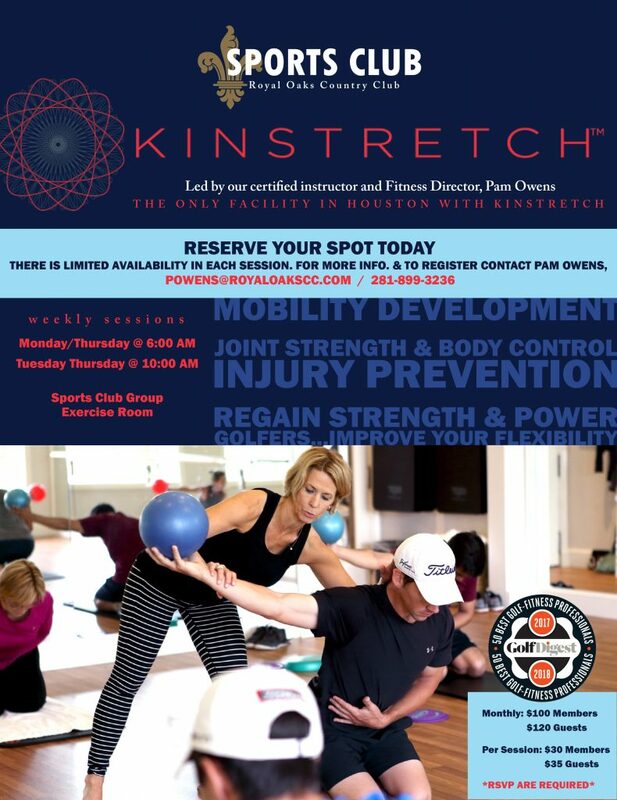 Join the Kinstretch Club of those who want to consistently commit to move better and become stronger. Sign up now to reserve your space for this year. Space is limited in person however there are online classes for monthly subscribers. RSVP required. PLUS Online Access to new recorded classes each week with listing of moves. PLUS Complete CARs video for your daily routine. Choose your time preference from A or B of 2 classes per week. You will learn a short daily mobility routine for non-class days. You will also get access to the private online classes. RSVP. Group rate allows you to save on the $110/$125 private training session fee and on the single class rate and assumes you may miss some sessions throughout the month due to holidays and travel. Long-term commitment is highly recommended. Join “the CLUB” and get moving better!